Sophomore guard Maceo Jack shoots the ball during a game against Towson Wednesday. When: Saturday, Dec. 8 at 4 p.m.
Men’s basketball (2–7) will take on Valparaiso (5–4) Wednesday in a match where the Colonials are coming off their second win about a month into the season. The Crusaders had a heartbreaking loss against High Point Tuesday that was decided as the Panthers drained a midrange jumper with 0.8 seconds left in the game. But Valparaiso has more than double GW’s successes so far this season heading into their Smith Center matchup. The last time the two programs met was in the final game of the 2016 NIT Championship, when the Colonials topped the Crusaders at Madison Square Garden to capture the program’s first postseason championship win. 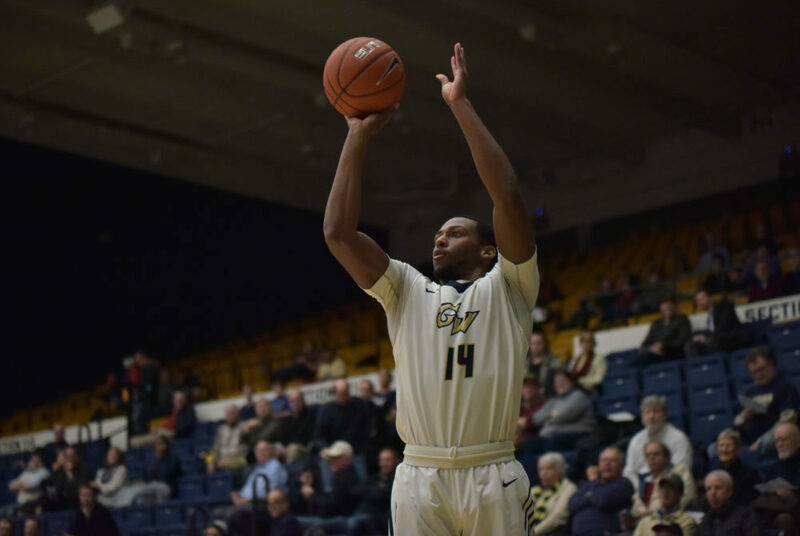 GW had its second-best shooting night of the year against Towson, ending the game shooting 50 percent from the field to improve its shooting to 40.1 percent from the field overall. Sophomore forward Javier Langarica had one of his strongest showings yet, playing a career-high 31 minutes in place of junior forward Arnaldo Toro, a starter who was benched for the previous two contests. Langarica picked up eight points and two rebounds in the game, but converted from the free-throw line to pick up crucial last-minute points for the Colonials in the tight contest. With leading rebounder Toro out for the remainder of the season, Langarica will need to continue stepping up to fill the hole in GW’s interior for a chance at success Saturday. The Crusaders carry a high-scoring roster, but the Colonials have the players they need to match Valparaiso’s scoring. Sophomore guard Terry Nolan Jr. and redshirt junior guard DJ Williams combined for 43 of GW’s 68 points against Towson and are coming off career-best scoring performances. If GW is able to hold strong on shooting and Valparaiso continues to struggle at the net, it could spell success for GW. The Crusaders are coming off their lowest-scoring game of the year and were held to 32.7 percent shooting on the night after going cold from the three-point line against High Point. With the team lacking size under the basket, the Colonials should look to force the Crusaders – a team shooting 31.9 percent from the three-point line – to shoot from the perimeter and hope for another off shooting night to secure a now-rare tally in the wins column. Valparaiso employs a stacked scoring roster, with four Crusaders averaging double-digit scoring so far, led by redshirt junior center Derrik Smits with 14.9 points per game. Despite the win against Towson, the Colonials allowed the Tigers to convert 45.6 percent of their shots on the night. With the team’s fifth- and sixth-best shooters still picking up 9.9 and 9.1 points per game, respectively, it will be a tall task for the Colonials to neutralize Valparaiso’s scoring, which averages 75.2 points per game. Smits poses a powerful threat for the Crusaders. Standing 7 feet 1 inch tall, Smits is 4 inches taller than the tallest rostered players for GW. A GW team grappling with Toro’s absence paired with Smits’ height could make the difference between a close match and a blow out in favor of the Crusaders. Toro’s absence leaves GW’s interior exposed, which is especially dangerous against a team that averages 35.6 points in the paint per game. If Nolan, Williams and Langarica step up like they did Wednesday, GW might be able to pull off the upset. But while the Colonials are coming off a hot shooting night, they still allowed Towson to shoot above average on the night. Considering Valparaiso’s lineup carries heavy point production and Smits will be difficult to contain down low, the odds are heavily tipped in the Crusaders’ favor.